This is another one that I brought back from my summer holidays. I have always loved this dish but have been intimated to attempt it. 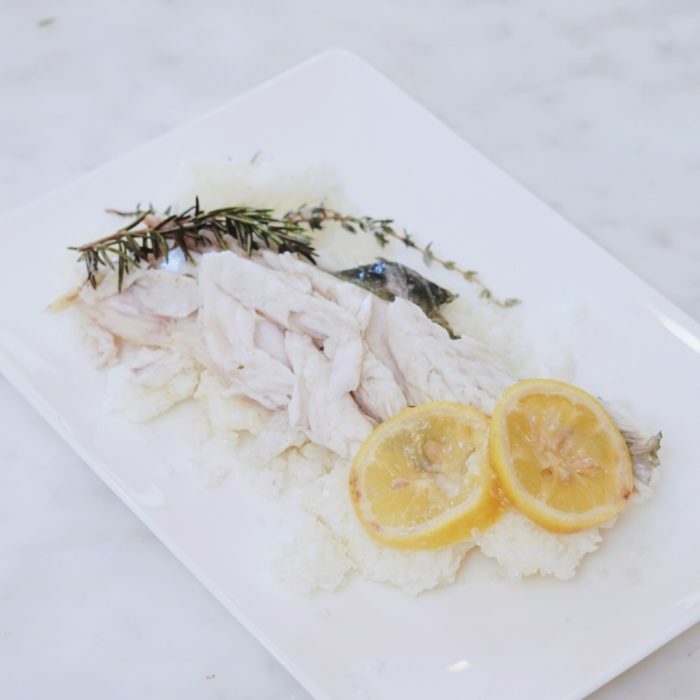 Roasting a whole large fish in a salt crust might seem scary, but it's actually quite simple. It keeps the fish from getting dry and adds tons of flavors form the herbs. Make the crust by combining salt, egg whites, wine and herbs; mix until it's the consistency of wet sand. Place the lemon slices inside the fish, drizzle some olive oil, and sprinkle some salt and pepper as well. Spread half the salt mixture on a lined baking sheet in a rectangle just larger than the fish. Place the fish on the bed of salt. Pat the remaining salt mixture over the fish to cover completely. Bake the fish for 30 minutes. Remove from the oven and let cool for 2 minutes. Using a large spoon, tap all around the edge of the salt crust to loosen it. Remove the salt top and carefully remove the skin. Use an offset spatula to remove the top fillet from the bones and transfer to a serving plate. (Wipe away any stray salt.) Use the spatula to lift away the bottom fillet and place it on the plate. Making this as soon as I get home from my business trip. Thanks again!